Sleek, simple, and distinctly modern, this chairside end table beautifully marries natural and urban elements. The unique table shape allows you to easily pair this table with a chair, as the metal base can slide under a chair to bring the laminate surface extra close to you as you sit. A mix of wood look top and urban metal, this chairside table ensures function and fresh, contemporary style. The Lucia Chairside End Table with Metal Frame at Morris Home in the Dayton, Cincinnati, Columbus, Ohio, Northern Kentucky area. Product availability may vary. Contact us for the most current availability on this product. Finish & Paint Options Tables are available with either a Brown finish a lighter, Brown/Grey finish, or a Gray/Black finish. Case Detail Metal bases on all tables. Case Construction Tables feature laminate tops with metal bases. 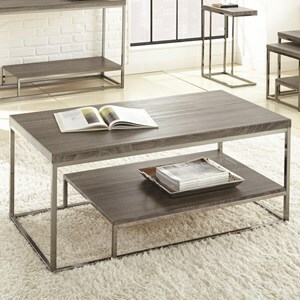 Equal parts contemporary minimalism and urban sleekness, the Lucia collection of occasional tables is all style. Tables feature a blend of laminate materials and urban metals for a fresh take on occasional decor. 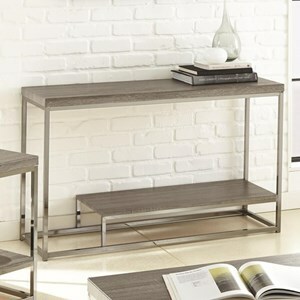 Metal bases lend a sleek touch, while wood-look laminate tops balance out the more urban look with fresh appeal. Select tables feature shelves that stretch only part way across the table, creating a table-within-table effect that brings a unique silhouette to any home. Urban and contemporary, with natural elements and simple function, each table from the Lucia collection makes a stunning addition to your home. 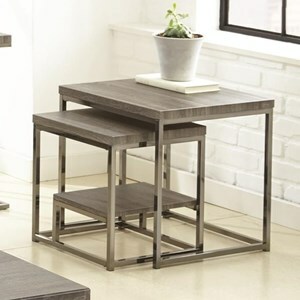 The Lucia collection is a great option if you are looking for Contemporary furniture in the Dayton, Cincinnati, Columbus, Ohio, Northern Kentucky area. Browse other items in the Lucia collection from Morris Home in the Dayton, Cincinnati, Columbus, Ohio, Northern Kentucky area.